I love finding a good reading nook wherever I may be. I have plenty of them in my home but sometimes I wish I had a purely dedicated space that was unique and special and just for reading where you could spend hours lost in a good book. So, I designed a fun and vibrant nook which you would never want to leave. I envision that laying on that chaise would be as comfortable as laying on cloud. The black lamp grounds the the space and it breaks up the color so it isn't overly sweet, because, let's face it, it has plenty of pink. This book is the perfect Spring read, and even more perfect to read now as mother's day is around the corner. It is a novel about two strong Southern mothers- one biological and one adoptive-and how despite how different they are, these women end up forging a lifelong connection around a baby. It is beautifully written with wonderful imagery that really make the characters come alive. It is an immense joy to come back to the book night after night when I get into bed at the end of a long day. Read more about the book here and read more about Kristy here. Kristy is so sweet she is offering a $1,000 Shop Design Chic Shopping Spree to one lucky winner. To enter you must send proof of purchase of Dear Carolina (photos are fine!) to readdearcarolina@gmail. Every book is an extra entry! And for all those who enter the contest they will receive a free e-copy of the Dear Carolina Companion cookbook, full of favorite Southern recipes from renowned bloggers and family members, and Dear Carolina printable quotes just for entering! Keep Dear Carolina in mind if you are looking for a great next read. Happy Tuesday! You are the best, Albertina! I am one proud Mom and am so grateful for the amdazing support of the blog world. Now I need that chaise for my reading…happy Tuesday! 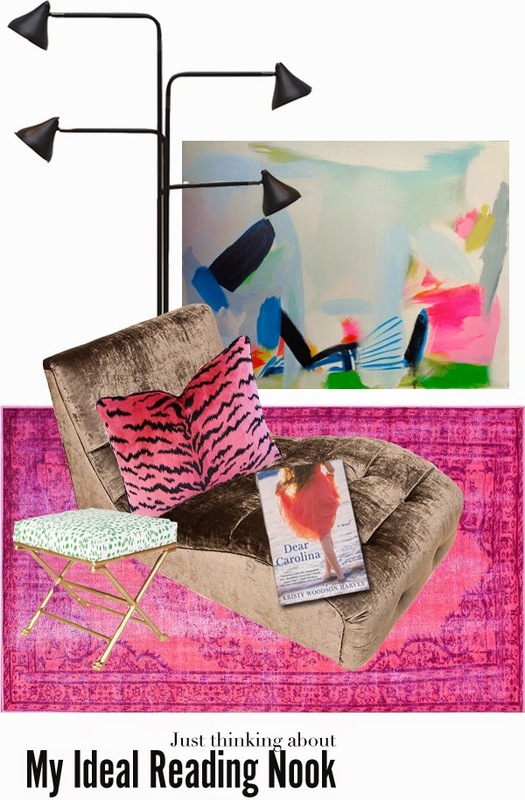 that chaise is very interesting... love your look, hope you win!